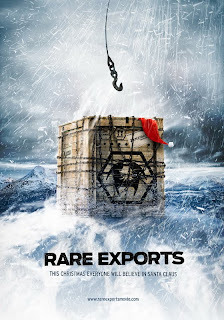 By now, you've probably seen the trailer for the upcoming film Rare Exports. I've posted it below if you missed it. Suffice it to say, this is a Christmas tale with a very unique spin that put a smile to my face. What you may not know (hell I didn't know and both the shorts below went crazy viral years ago) is Jalmari Helander (who hails from Finland) actually made an 8 minute and 11 minute short before he made this movie. Done in a documentary style National Geographic video, its your intro into this world of this rare and exclusive Christmas import. Sure, we may be over 3 months away from Christmas, but you can never not be in the mood for some holiday cheer. Check out the shorts below. Well this year, we'll see a full movie on these shorts. From the reviews its getting, everybody thinks its awesome. I can't believe I totally missed these hilarious yet poignant shorts from 2003 and 2005. I'm glad I'm now caught up because Rare Exports is going to be one of the most classic, inventive and LOL awesome films to come out of Europe. Check out the fully extended trailer for the upcoming movie below. What are your thoughts on the shorts and upcoming movie? Let me know!